There's just something about using up the last bit of a product I always find somewhat difficult. Plus it always takes me ages to get a large enough collection of empties to make them worth mentioning, but I've finally gathered up enough used up/expired products to chat about. I've been using this can of Dove Hair Therapy Volume Dry Shampoo for a good year or so now and am happy to have finished it up. It's not a bad dry shampoo and I really loved it when I first discovered it a few years ago, but lately it's just not my cup of tea. I'm in the market for a new option so leave suggestions in the comments. If you are a regular reader of Microscope Beauty than you already know about my bareMinerals Complexion Rescue obsession. I've finished up the first tube of it and already am well into my second. It's the best light-coverage every day base that leaves my skin glowing and looking healthy. The Nourish Organic Coconut lotion finally saw its end recently. 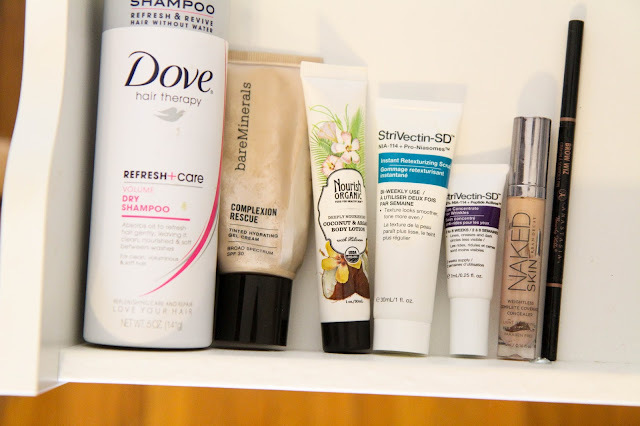 I really enjoyed using it, but lotions are the kinds of products that are so easy to jump around within the category that I doubt I'll ever pick up another one in the full size. Great lotion though if you're in the market for one! For random products I've used up/they've expired before I can finish them, there are a couple of StriVectin products that I never got around to using up. The first retexturizing scrub was a bit too harsh on my skin so I never could get along with it. The eye concentrate didn't really seem to do anything like I find for most eye products. It's so hard to tell if they're working and I usually just stick with one I know and love rather than jump around. I've been enjoying quite a few StriVectin skincare products these days but these two just couldn't do it for me. The Urban Decay Naked Skin Concealer and the Anastasia Brow Wiz are both staples in my makeup collection and I go through quite a few throughout the year. They're reliable, great quality products that never let me down.